On a recent trip to Pattis (read here and here for more about Pattis) I took some pictures of these beautiful outdoor sculptures that were on the grounds of the restaurant. This one was sailboats which rotated with the wind. This one had whales in a circle with a god like man in the center. Above is the placket identifying the artist John Toras. More information about John can be found in this great article I found here at Posh Magazine. 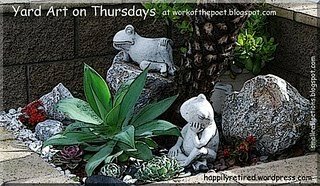 Today I'm linking to Outdoor Wednesday at A Southern Daydreamer and Yard Art Thursday at Work of the Poet. Click on the links to visit their blogs for more posts. What an interesting and different post. I really like seeing things unique and these sculptures are certainly are. Thanks for sharing such interesting sculptures. Dropping by from Outdoor Wednesday. These are awesome. I think the sailboats are my favorite! These are fun...I love the sailboats. What a vision he has. Those sculptures are really neat. These are fascinating. I especialy like the sailboats. These sculptures are amazing! The sailboats are my favorite too! Your porch looks gorgeous as well! What a lovely outdoor photos, they are cool. I love the sculptures! Miss Madison is a cutie!